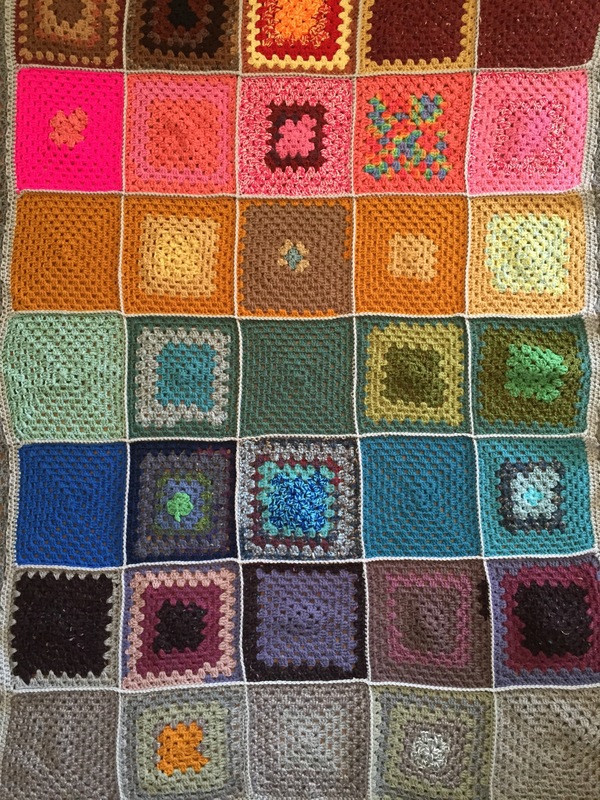 I’ve been telling you about the beautiful crochet blankets donated for Crochet For Kidneys Part 4 since June 2015. I’ve showed you photos of all the blankets, told you who made them and where the makers are from. I’ve thanked everyone for donating their skill, yarn and time to this project. 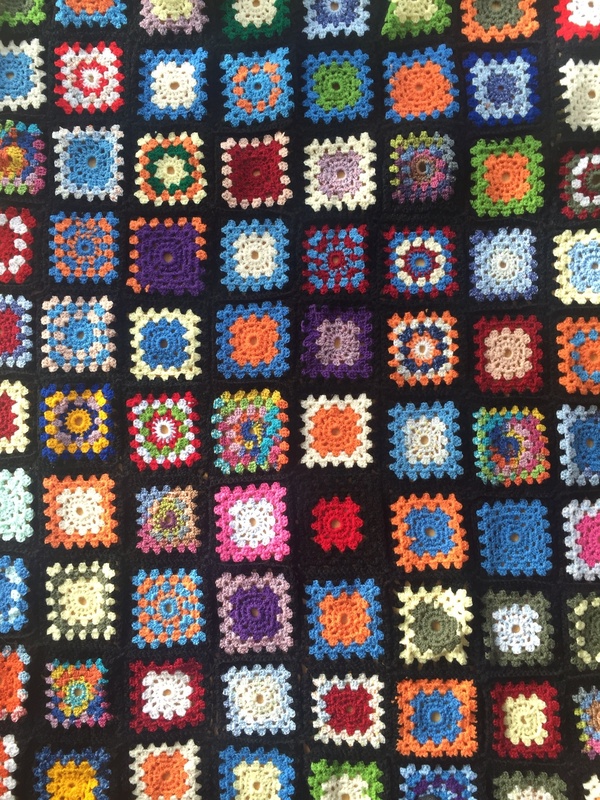 Yet pretty crocheted blankets is not what Crochet For Kidneys is about. 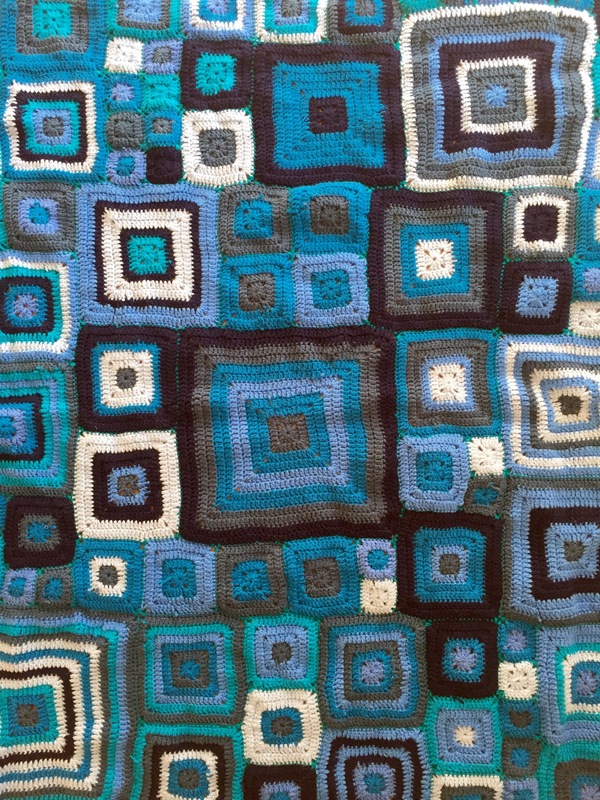 Crochet For Kidneys is about doing something for the people currently going through dialysis. John donated his kidney to a friend because we heard and saw what 3 4-hour dialysis session a week does to a person. 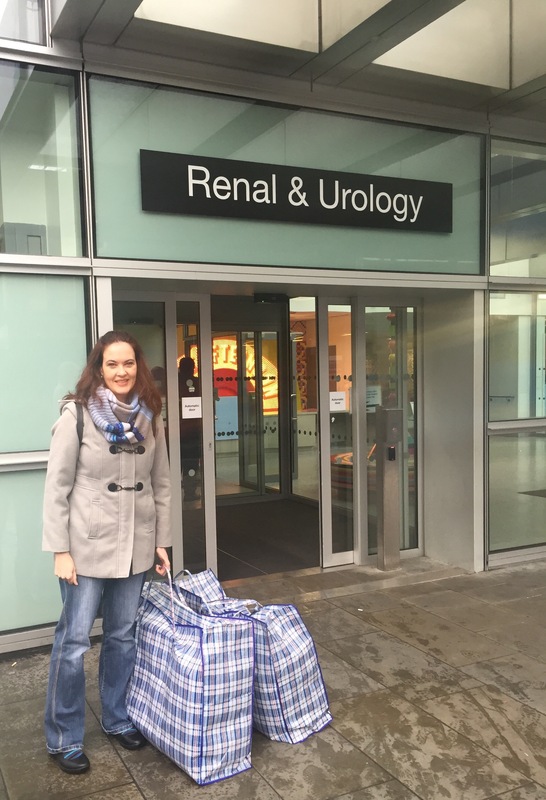 In writing this post I realised I had to find a first-hand account describing what it is like going through dialysis. I found a few articles and a NHS video which gave the impression that you can have a very normal, active life. This may be true for a lot of people but it wasn’t the impression I got from the man to whom John gave his kidney back in 2012. Yes, he was able to go to work and lead a relatively normal life, but he certainly did not feel like a million bucks after a dialysis session. The limitations of what he could eat and drink affected his life, the timings of the dialysis session and the after effects limited how much time he could spend with friends and family (and indeed his wife), not to mention the psychological toll. I then came across “A Rookies’ Take On Dialysis: Ten Things I Have Learned So Far” a blog post by Tim Bergman of Ontario, Canada. Please read his post. It’s an eye opener and gives a true sense of what it is really like being on dialysis. Tim’s account of dialysis is much closer to what the recipient of John’s kidney experienced and will give you a sense of 1) why John decided to donate his kidney and 2) why I felt I wanted to do something for dialysis patients. Wait until you get to point no. 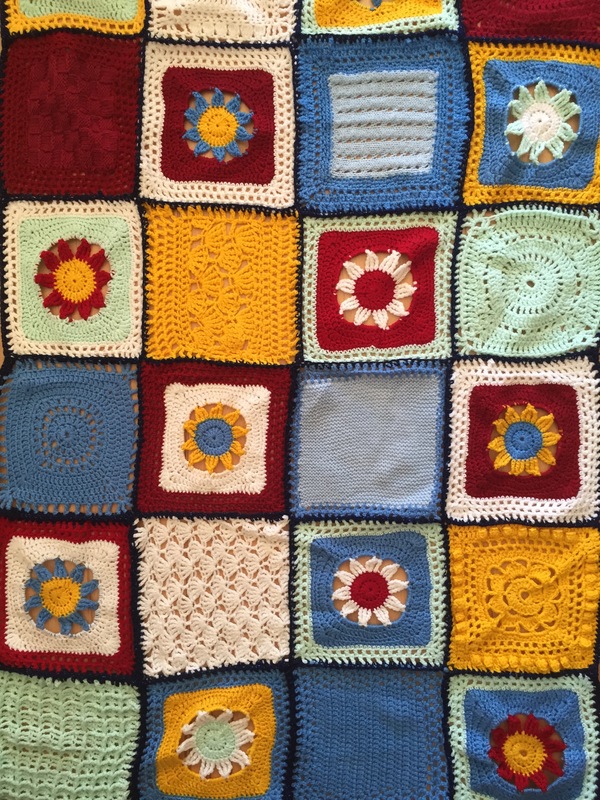 4 in Tim’s post – Crochet For Kidneys will make total sense. 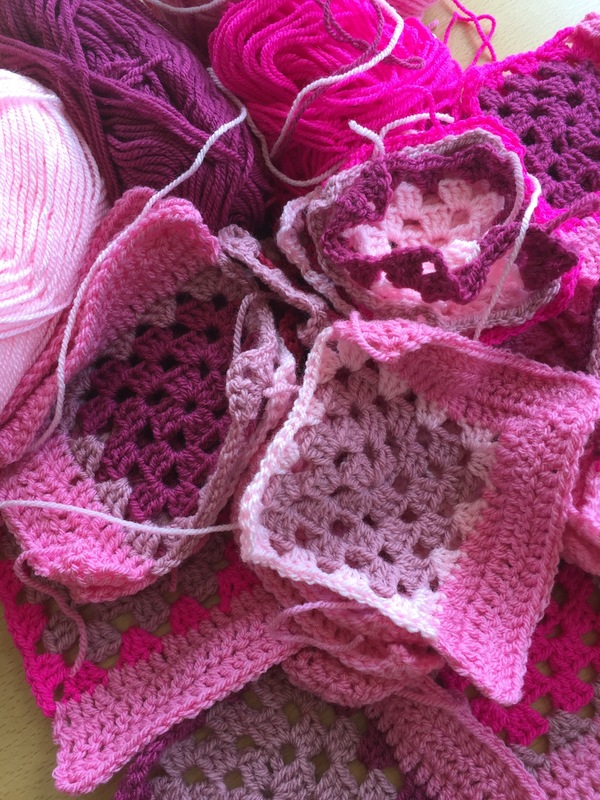 The big day for Crochet For Kidneys Part 4 is almost here! John and I are taking the blankets to the Royal London Hospital on Tuesday so this weekend was spent writing note cards, putting the right card to the right blanket and updating the Facebook Group with all the blanket photos. Here is one of the notecard, attached to Sue de Vos’s blanket. Look how many beautiful blankets we have! The sun was shining into our apartment while I was folding and tagging blankets. I took that as a good sign. I’m so proud of what you guys have achieved here. None of you skimped on creativity, quality of the yarn or the finish and some of you even made two blankets. You posted them from as far as Portugal and the USA without any thought to the cost of postage. Thank you so much. Isn’t this a lovely sight? 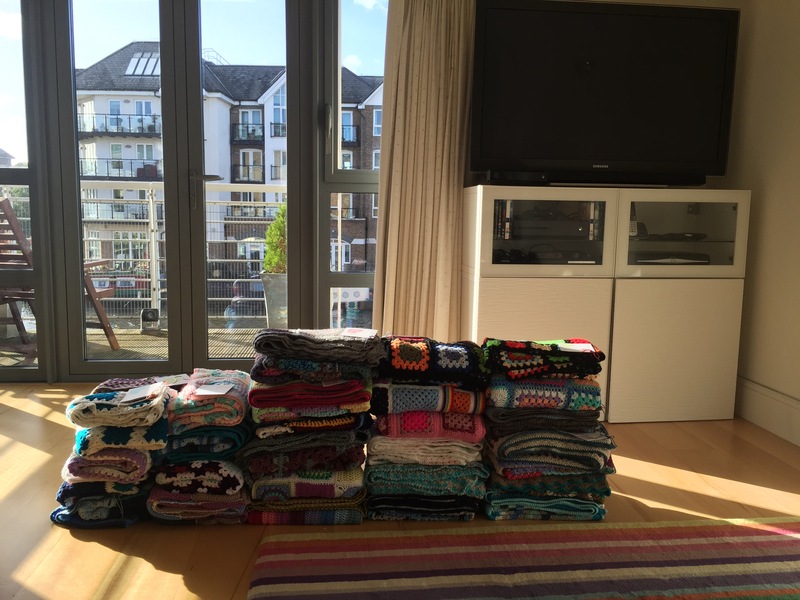 Nevermind the telly or the view, look at all those lovingly made crochet blankets for 27 dialysis patients! I’ll update you all on delivery of the blankets, after Tuesday. 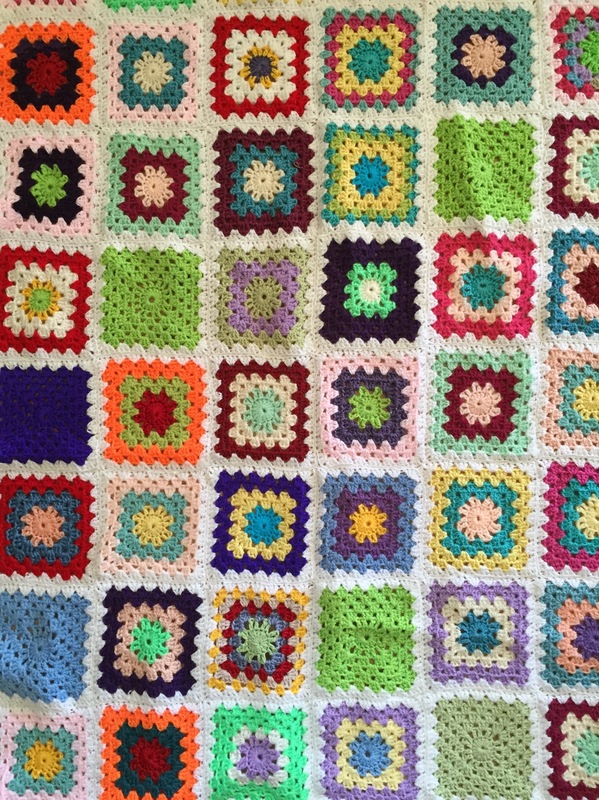 I have one more blanket to show you for Crochet For Kidneys Part 4. 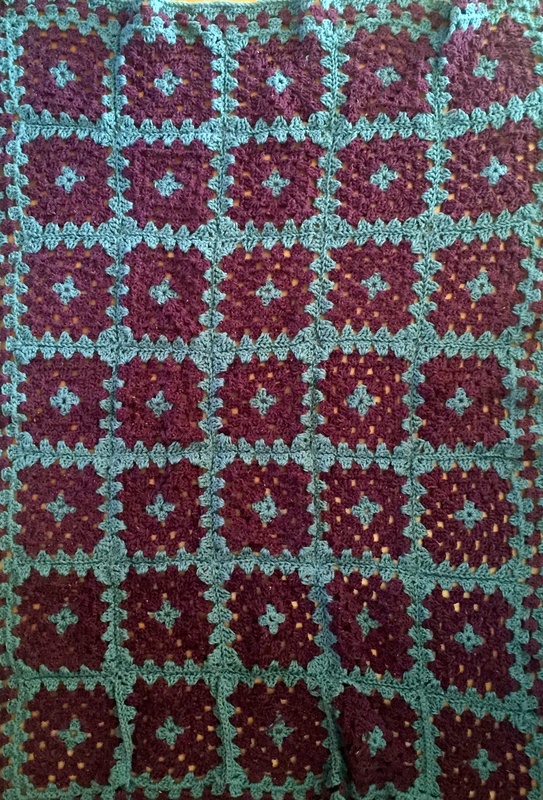 A beautiful giant granny square blanket made by Jennifer. 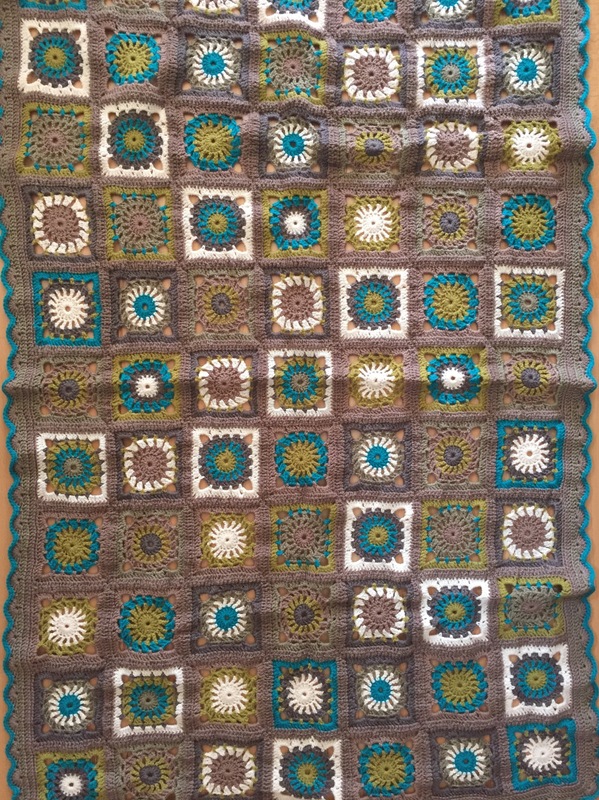 I love the muted shades she used, and what a clever idea to start off with two 4-round granny squares? 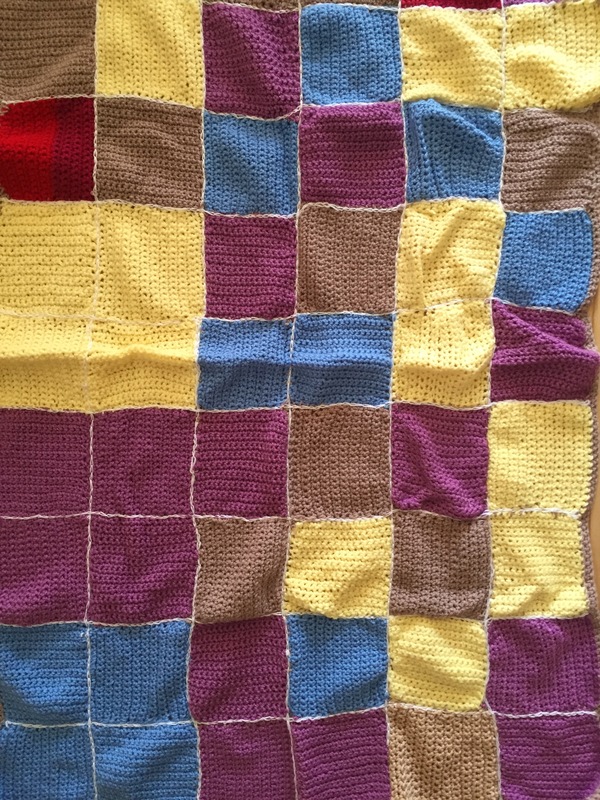 Jennifer hand delivered the blanket to my home – I’m so sorry I was at work when she came over. Jennifer’s blanket came with this really cool card. Life is definitely much better when you’re laughing! With Jennifer’s blanket, our total is now at a record 27 blankets for dialysis patients! That reminds me: have you guys seen the graph I made to show how the blanket count has gone up over the four CFK’s? I posted it on the Crochet For Kidneys Facebook group a few weeks ago, but here it is again. Blanket count up, participants down. Who would have thought?! Now that all the blankets are in, I’ll be spending today and tomorrow hand writing the tags to go with each blanket. We’ve also been thinking about the logistics of carrying 27 blankets to the hospital. Last year we had three huge bags for the 17 blankets of CFK3, so 27 is going to be even more challenging. Fortunately John had the great idea that we should vacuum pack the blankets which will reduce the size considerably. Clever man! And so on this Halloween we reach the deadline for Crochet For Kidneys Part 4. 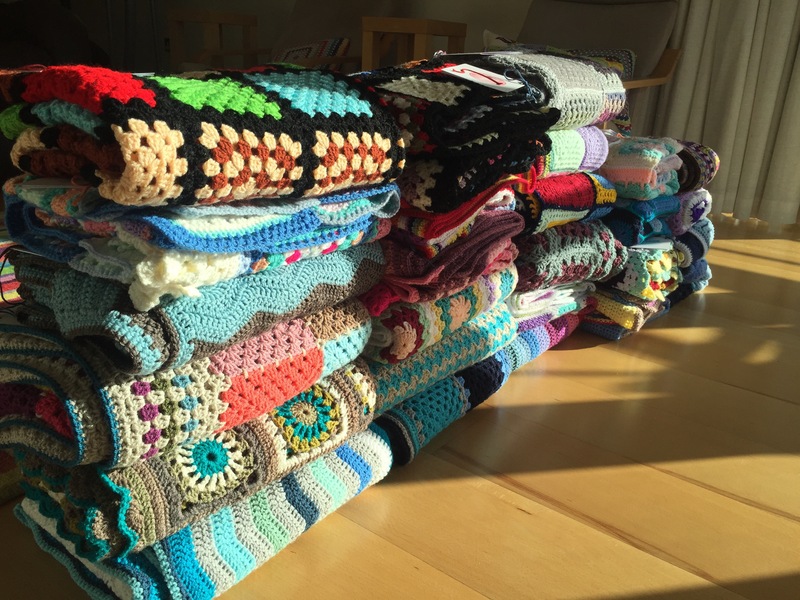 It’s been a heart warming and humbling four months since my fourth appeal for crocheted blankets. 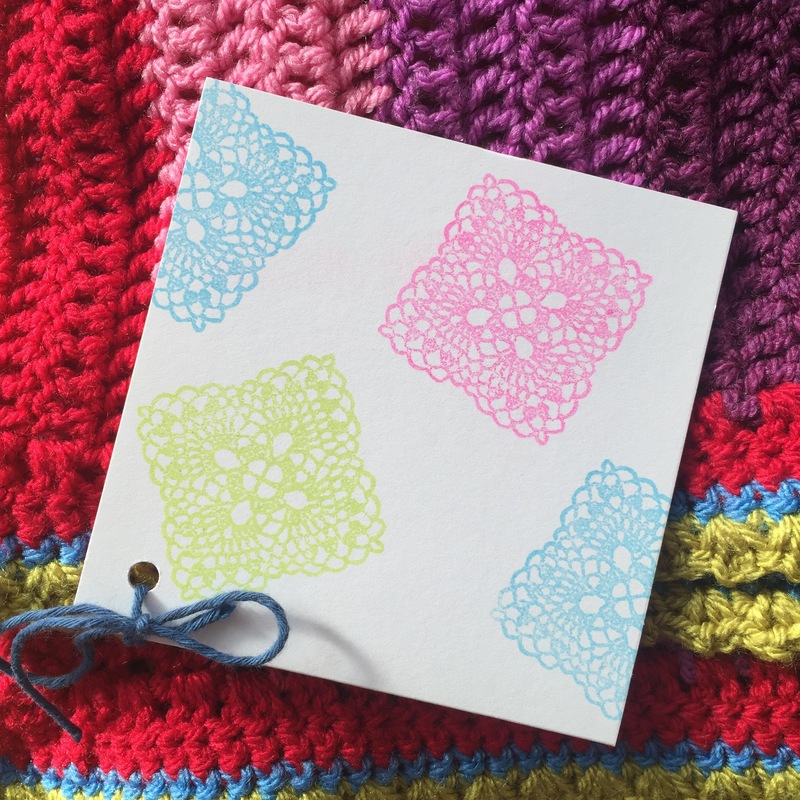 My amazing blog readers and crochet friends delivered the goods – in spades! 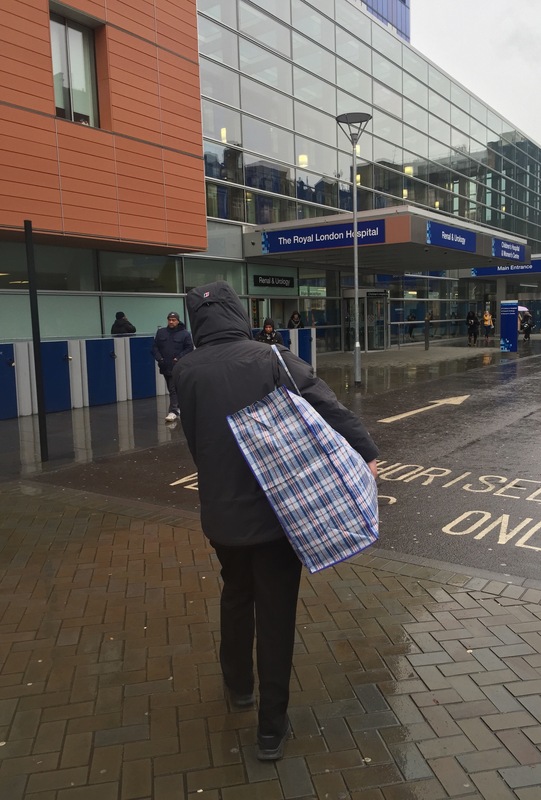 With the four blankets I received this week, we have reached a grand total of 26 blankets for the dialysis patients at the Royal London Hospital! 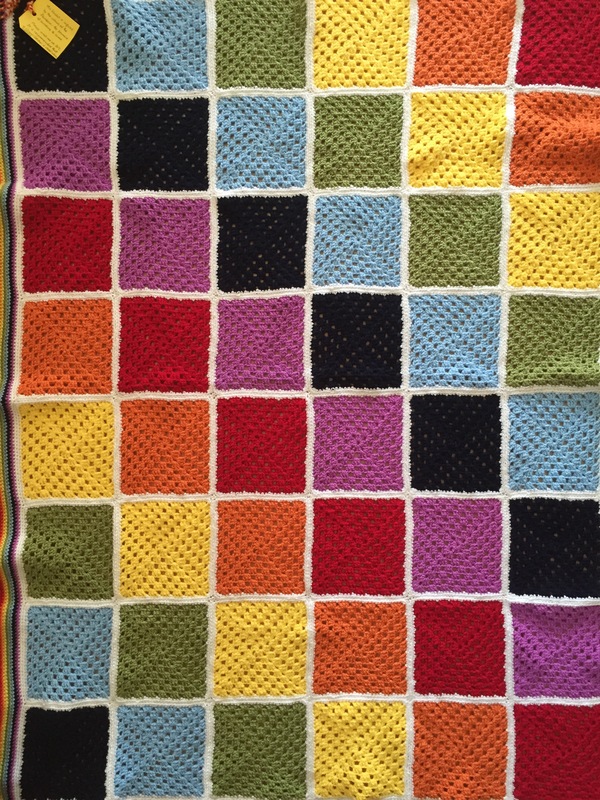 That’s our highest blanket count since I started Crochet For Kidneys in November 2013! This week Dorota’s blue and brown ripple blanket arrived all the way from Poland, Barbara’s second colourful traditional granny square blanket arrived from Portugal, Pauline Thomson’s granny square blanket in a comfy chunky yarn arrived from Scotland and Cecilia sent her very striking granny ripple. 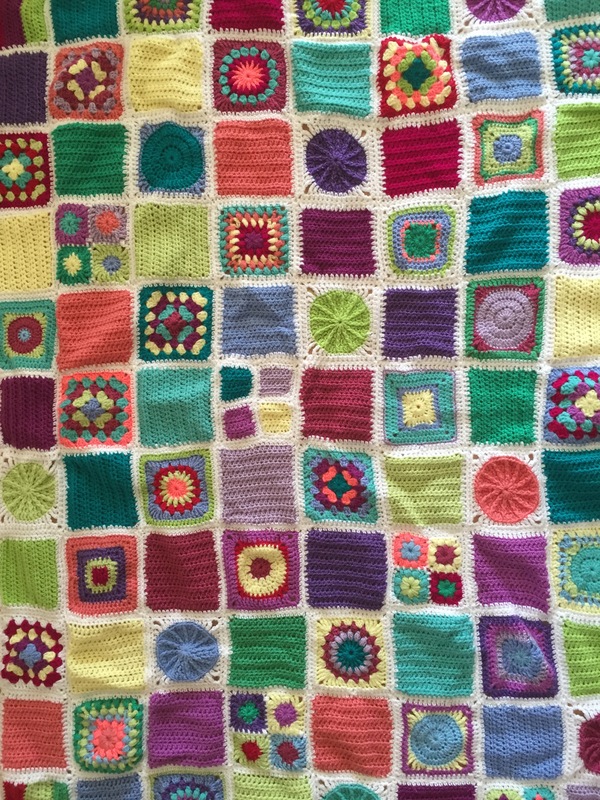 Cecilia is an old-timer CFK member – you can see a photo of her in this blog post from the Crochet For Kidneys charity day back in November 2013. 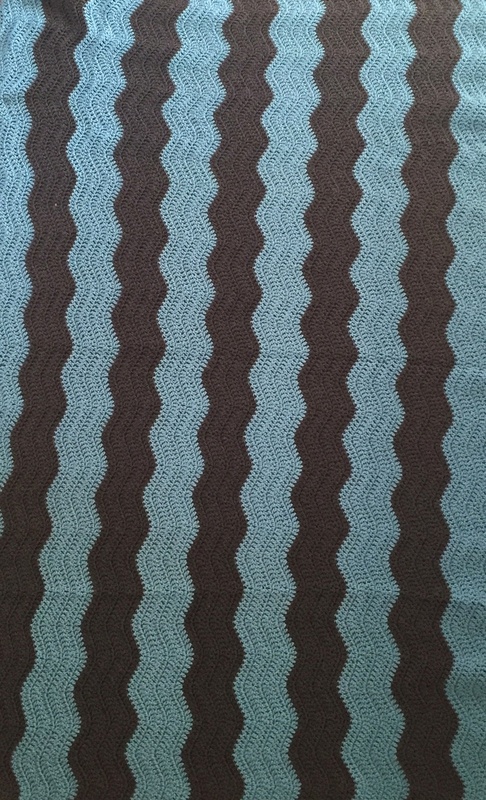 Cecilia crocheted her first ever blanket for CFK3 last year, and this ripple is her second blanket. 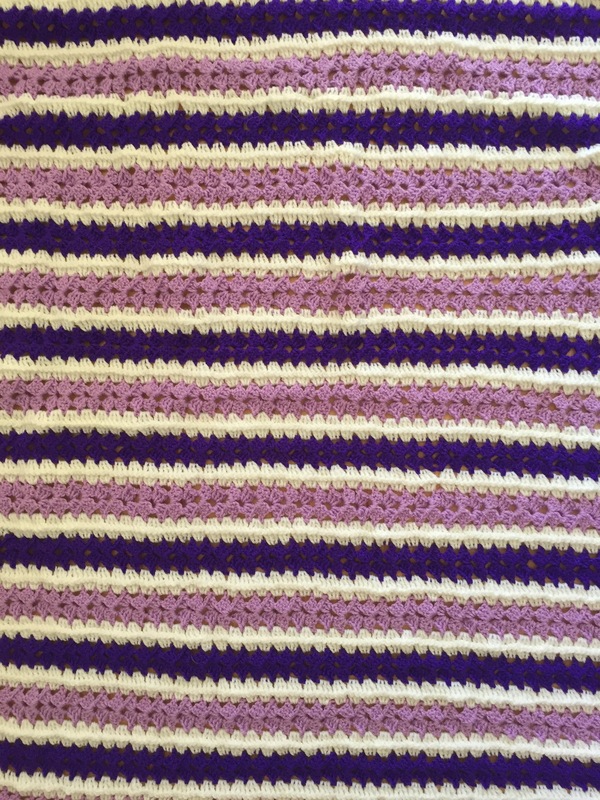 It takes Cecilia longer than the average to crochet a blanket because she suffers from muscle dystrophy. Just like last year, I feel very privileged that she would spend so much time on a blanket only to donate it to CFK. Thank you so much Cecilia, your selflessness is a true inspiration. Everyone put so much care and love into their blankets I’m positive it will bring years of comfort and hope to the dialysis patients. 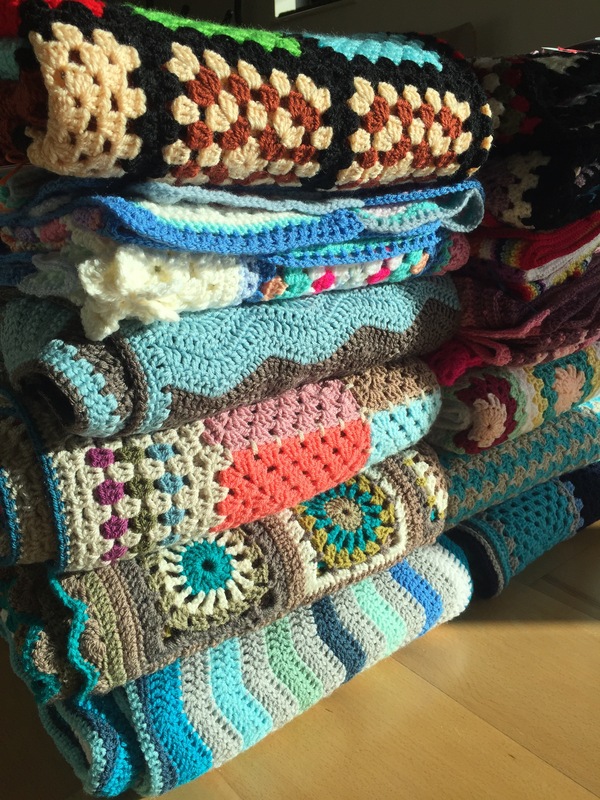 Whenever I look at my two cupboards filled to the brim with handmade blankets I am reminded of just how special you all are. Thank you and blessings to each of you. The blankets for the dialysis patients are coming in weekly now and our total blanket count is up to 13. Thank you everyone!! 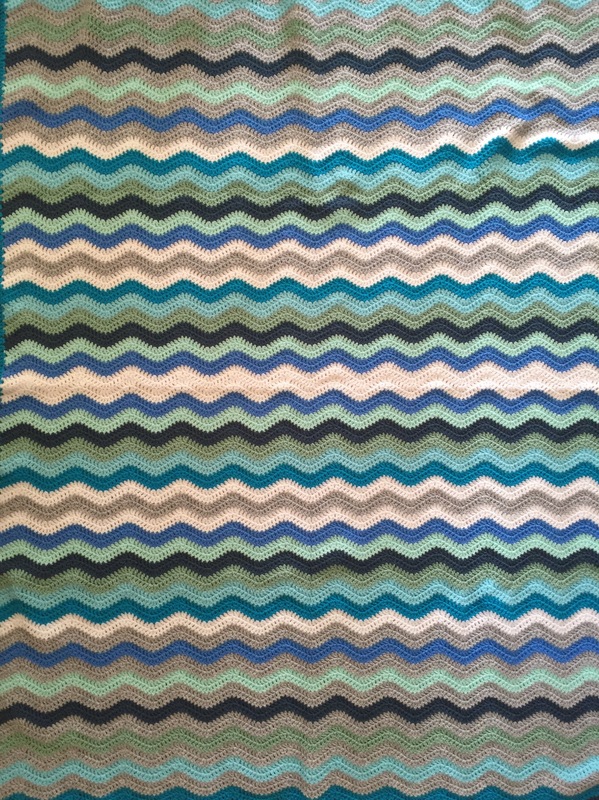 This extremely sunny blanket was made in Faro, Portugal. 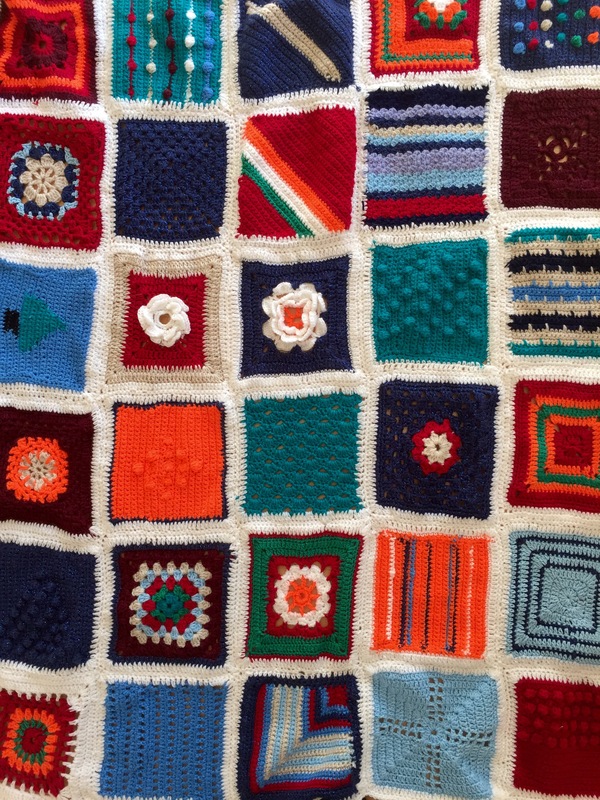 It’s the crochet work of Linda Baker, a friend of Barbara Booth whose blanket I showed you last week. Even if I hadn’t known Linda lives in Portugal I would have thought that this blanket has a distinct sunny Portuguese or Spanish feel to it. Don’t you agree? These two ladies are bringing the sunshine of Portugal to our blanket collection and they are making two blankets each. Fantastic! 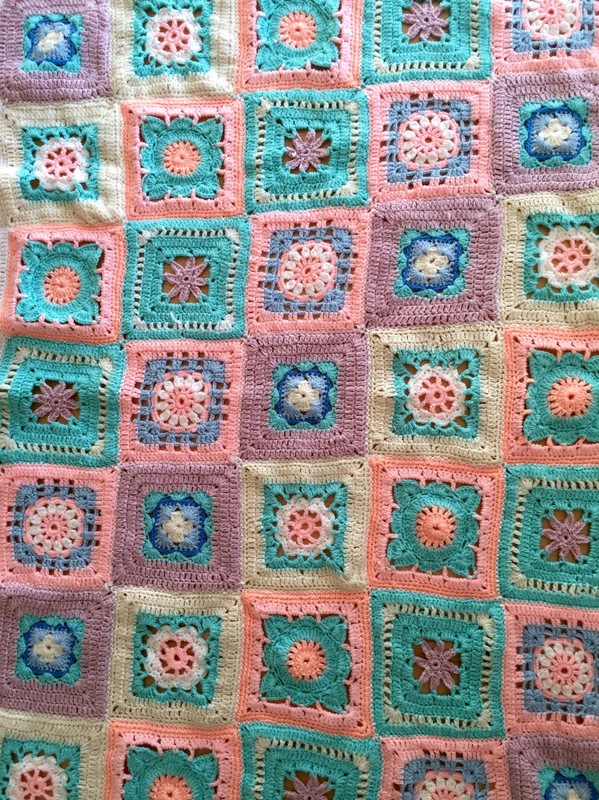 Not so much sunny as girly, my pink blanket is almost finished – I’m crocheting the edging at the moment and then have to work away the ends. 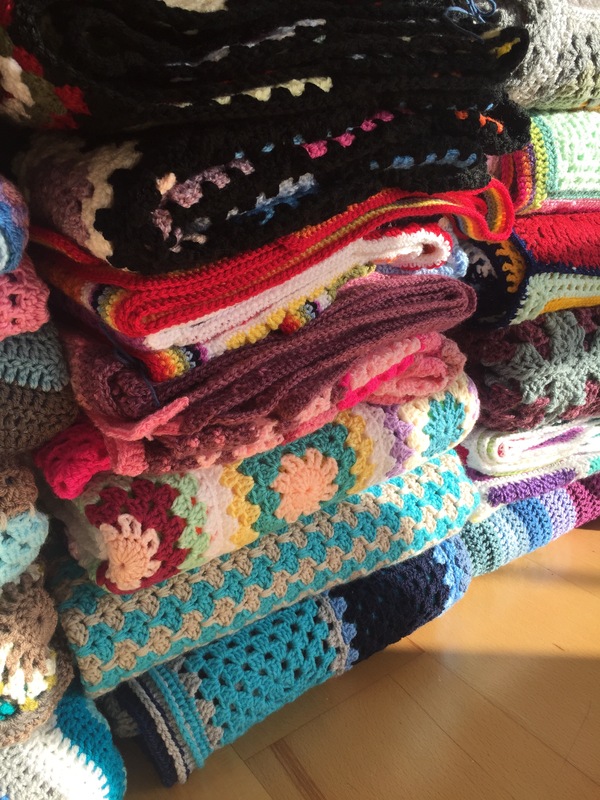 Thank you again to everyone who has crocheted blankets for the dialysis patients. Most of you are repeat contributors to Crochet For Kidneys which makes me appreciate your efforts even more. Blessings to you all! 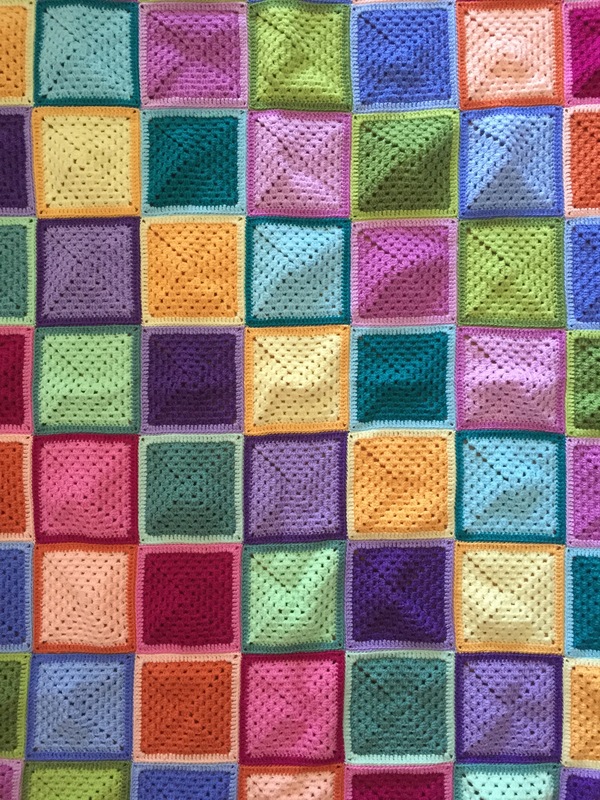 I received two more beautiful traditional granny square blankets over the past two weeks. Caroline Bennett says her fiancé had a kidney transplant 2 and a half years ago after being on dialysis. 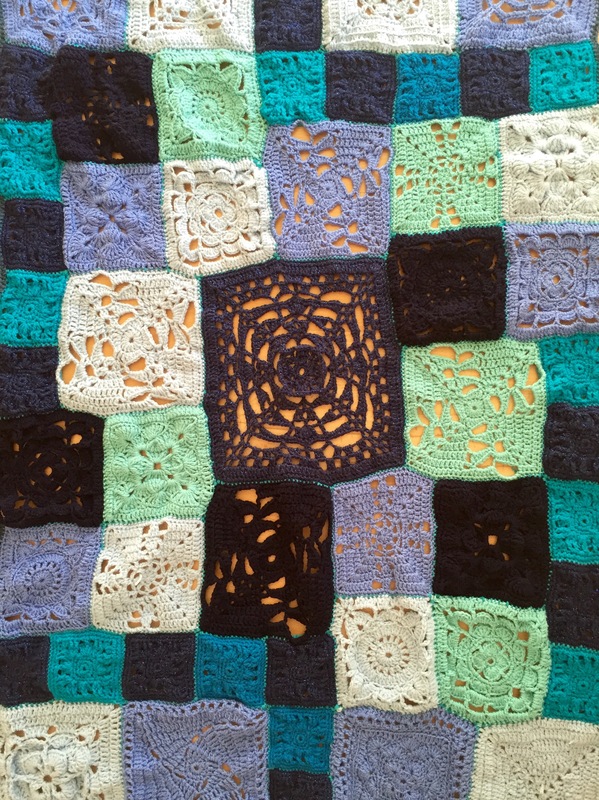 They think Crochet For Kidneys is a great idea and it inspired Caroline to make these beautiful two-tone granny squares. 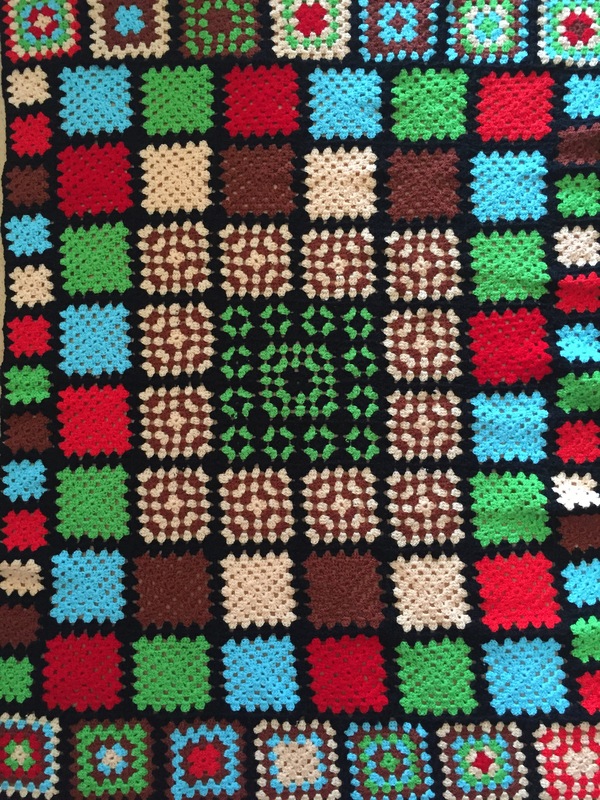 Barbara Boothman’s striking traditional granny square blanket with the black joining rounds, comes all the way from Faro, Portugal. She has another blanket to send me. Thank you very much for your contributions ladies. The blankets are beautiful! 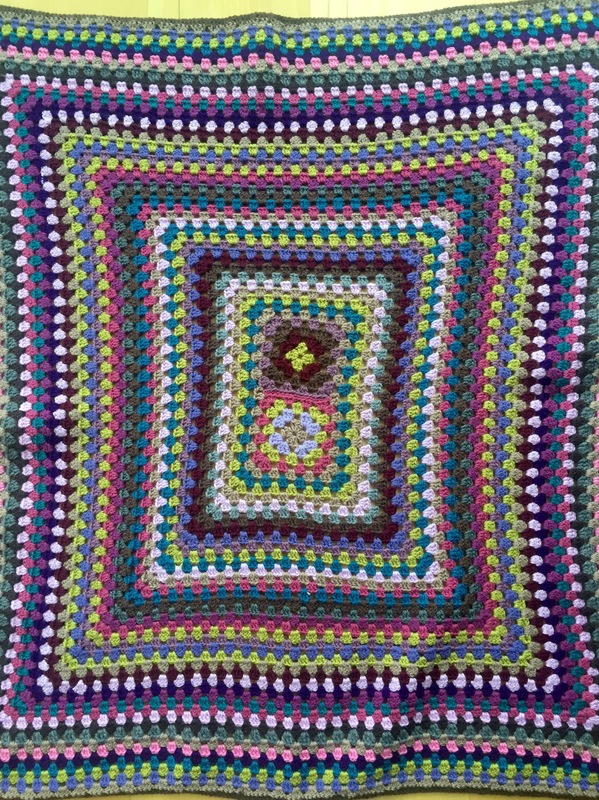 Hop on over to the Crochet For Kidneys Facebook group where you will see more photos, posts and comments about these blankets. Our blanket total is now up to 11. We’re in the double digits people!! Keep them coming! I received these four blankets from a mother and daughter team, Emma and Sandra Ashman. Thank you so much ladies, the blankets are beautiful! Thanks to this mother and daughter team, the CFK4 blanket count is now up to nine. Thank you ladies, you are stars! 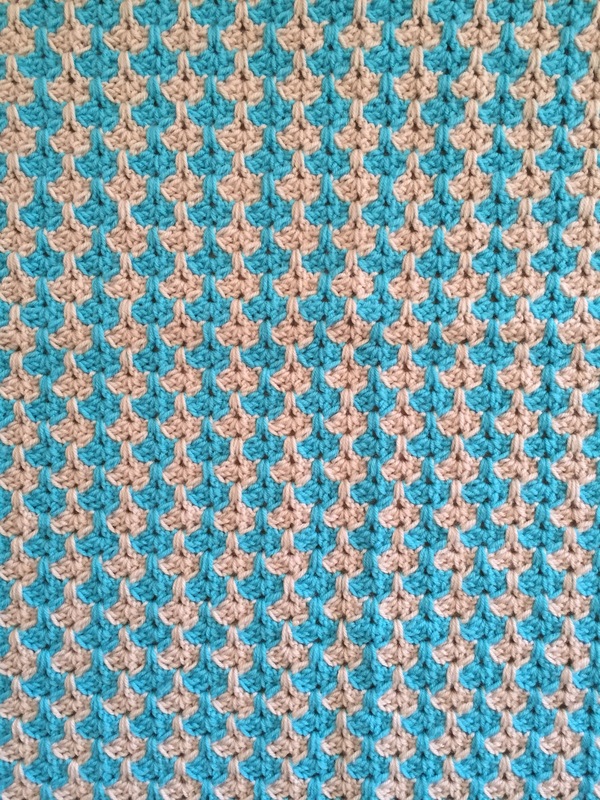 Dear readers and Crochet For Kidneys blanket makers, please forgive me for not having updated you on the progress of CFK4 since June, when I showed you my Shades Of Blue Granny Square Blanket. Things have been a bit hectic the past two months. It’s all very, very good though. My weekends were spent preparing for interviews, watching Lynda.com videos to improve my skills, celebrating Big Events with new and old friends, doing a bit of travelling with iVan the campervan and in general just enjoying life. During July I went for job interviews and in August I heard that I got the job as legal PA at a very big Media & Entertainment company just 20 minute walk from our new home. I am super, super, excited and feel very blessed to have landed that job. I just know it’s going to be the start of Something Great. My last day at the old job was Friday and I start the new one next Monday so this week is my time to reflect, recoup and recharge – and with recharge I mean catch up on my blog and crochet. So without further ado back to the blankets for Crochet For Kidneys. 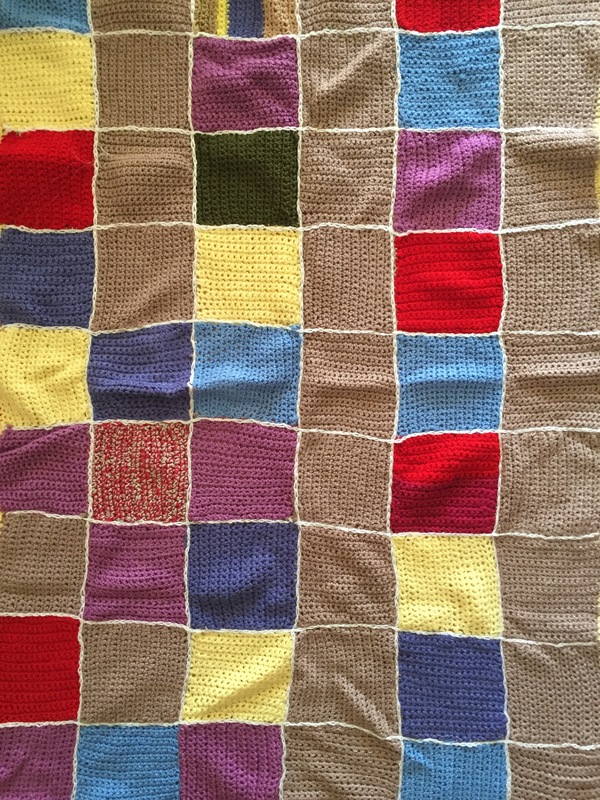 I’ve received four beautiful blankets so far from Gerlene Kennedy, Jan Appleton, Marion Nelson and someone with a postcode of DE66. The lady didn’t add a note so I don’t know anything else about her. 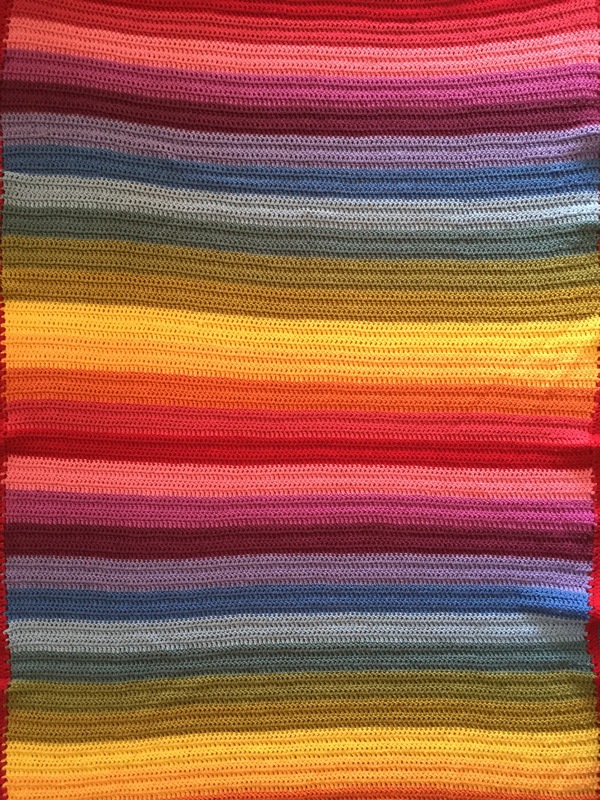 I love these blankets for being so very different. The beautiful colours, the combination of those colours (shout-out to Gerlene and Jan for great use of colour! ), the neat stitches and attention to detail that the ladies put into their work is really inspiring. A special mention should also go to Gerlene for using the softest silver grey yarn ever. I just couldn’t stop touching that yarn! 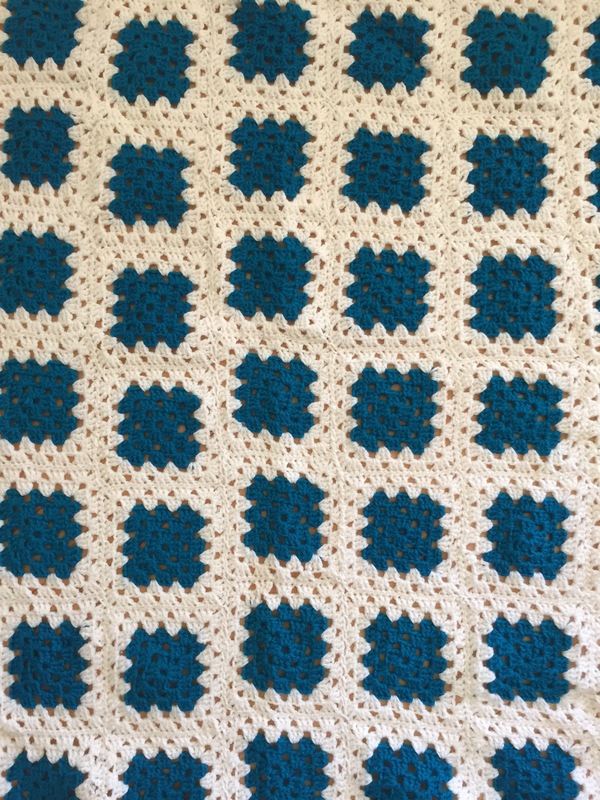 I was so inspired that I decided to move away from a regular granny square for my second CFK4 blanket. 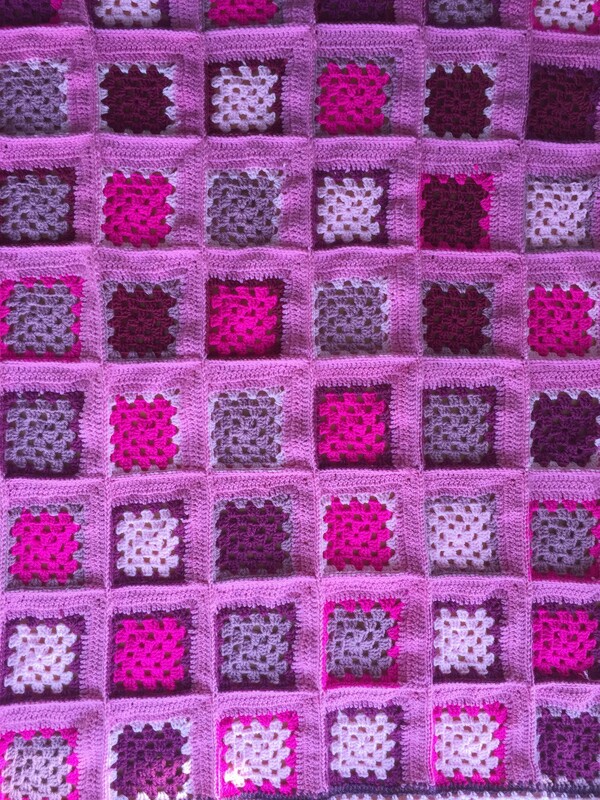 I’m making metered granny squares in shades of pink. 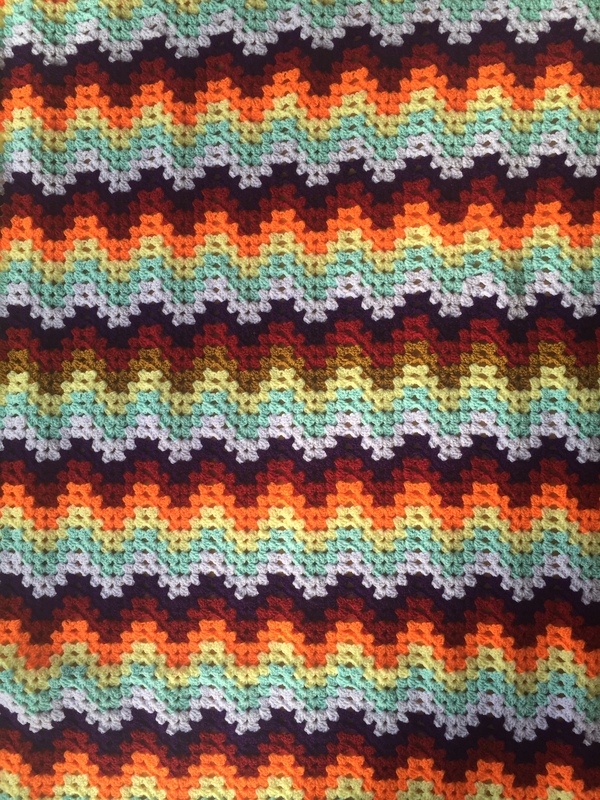 I’ve never done mitred squares but I really like the effect those off-centre rows create. I’m using up all my DK acrylic pink yarns for the blanket. This is going to be one very pink blanket! I look forward to receiving more of your blankets and I promise to post them on the blog much sooner than I did for these four blankets.